Yes, one last post about the owls I saw on my Sax-Zim Bog trip. 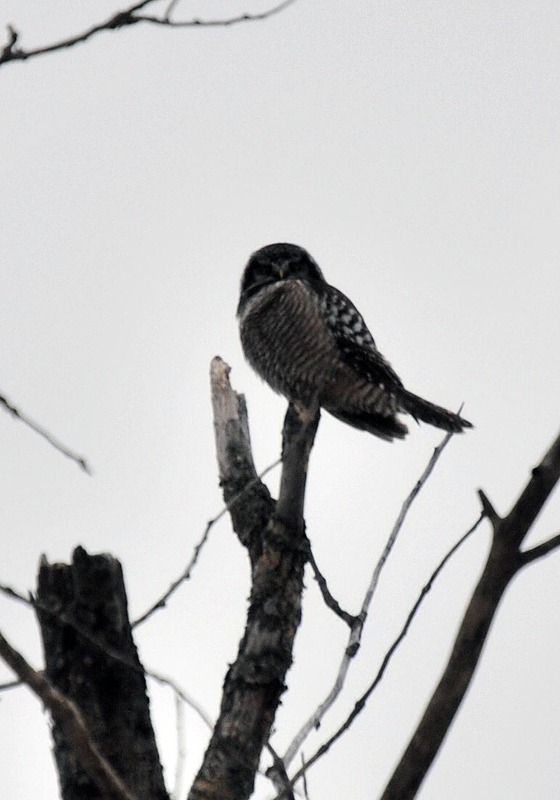 Like the Great Gray I posted about last Friday, I saw my third and final owl species not in the bog itself, but in the Duluth area. Hawk-owls get their name from the fact that they’re, well, a bit hawkish. See that long tail? In flight this bird looks almost more like an accipiter (like, say, a Cooper’s Hawk) than an owl. They’re active during the day, hunting prey from conspicuous perches at the very tops of trees, like a kestrel or a shrike. Like the Boreal and the Great Gray, this is primarily an owl of the great northern forests, both in North America and Eurasia. This concludes the tale of my Sax-Zim Bog trip. That means it’s time to start planning my next birding adventure… anyone up for lekking prairie chickens in April?